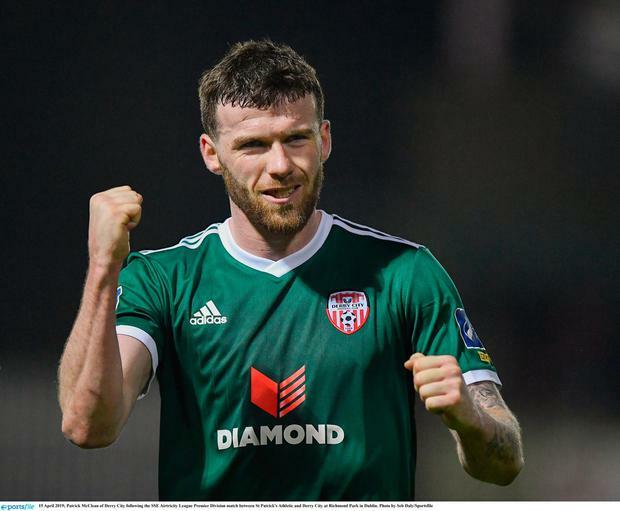 The fourth straight league win for the bang-in-form Candystripes now sets up nicely Friday’s top-of-the-table clash when Shamrock Rovers visit the Brandywell. Greg Sloggett laid the ball off to left-back McClean to strike a shot that seemed to deceive St Pat’s ’keeper Brendan Clarke to squirm under him into the corner of the net. An 18th-minute foul on Darren Cole brought a free-kick some 25 yards out which Argentinian midfielder Bruna whipped up and over the wall and into the bottom left corner. A minute later, St Pat’s defender Kevin Toner recklessly lunged into Derry skipper Ciaron Harkin on the halfway line to be shown a straight red card. Derry then extended their lead further on the half hour. Cole’s flighted cross from the right found Ogedi-Uzokwe who swept home his first league goal for the club. St Pat’s got a goal back within two minutes, Gary Shaw, who narrowly failed to get his head on the initial cross, then met a Simon Madden diagonal ball from the right to glance a diving header past Peter Cherrie to the net. To their credit, St Pat’s worked hard to play their way back into the game with Shaw inches wide with another header from a Madden delivery on 65 minutes; however, having played for over an hour with 10 men before earning a last-minute equaliser against Cork last Friday night, they were unable to find a second wind and spark a revival. For Pat’s manager Harry Kenny and the disappointed home support, the damage had all been done in a madcap first half. St Pat’s – B Clarke; Desmond, Toner, Kelly; Madden, McCabe (Coleman 45), Lennon (D Clarke 76), Clifford, Bermingham; Markey (Walker 80); Shaw. Derry City - Cherrie; Cole, Kerr (Toal 88), Gilchrist, McClean; Harkin, Bruna (B McNamee 71); Stokes (Coll, 66), Sloggett, Ogedi-Uzokwe; Parkhouse.